A new initiative is facilitating meaningful business connections between large employers and Dayton’s growing startup community. Through one-week long design sprints, startups and employees from large companies team together to solve some of the toughest problems at the large employer. A design sprint is a five-day process for answering critical business questions through design, prototyping, and testing ideas with customers. Developed at Google Ventures it’s a “greatest hit” of business strategy, innovation, behavior science, design thinking, and more—packaged into a battle-tested process that any team can use. Presented by Ascend Innovations, this sprint will focus on the development of a mechanical system that will help patients with a history of illicit injection drug use to receive appropriate and necessary hospital care without the added costs of an extended stay. This sprint will take place at 444 E 2nd Street in downtown Dayton from August 13th to August 17th during normal work hours. If you would like to participate in the sprint, please submit your application by Friday, July 27th. Selections will be made by the end of July. We need people with mechanical design or prototyping expertise, people in the medical industry, engineers, and designers. This team of 5-7 will then work together for the week to find a solution to our customer’s need for a mechanical system that will help empower patients with a history of illicit injection drug use to still receive appropriate and necessary care without the added cost of an extended hospital stay. Do I need to be there all week? The core team selected from the application process will be expected to participate 6 to 8 hours/day Monday (8/13) through Friday (8/17). Generally, the days will be built around work sessions 9am-noon & 1pm-4pm each day. Are there ways to be involved without committing to a full week? Yes! There will be opportunities to contribute to the process by challenging the core team’s assumptions and providing feedback on the solution they develop. Stay tuned for details! Connections – Ascend Innovations works at the intersection of local hospital networks, the medical device industry, and the innovation ecosystem. This sprint provides an exceptional opportunity for you and/or your company to connect with the people and resources surrounding this challenge. Business Opportunity – Ascend Innovations is presenting this challenge because it is a known need with a known and accessible market. Alongside Ascend, the startups and individuals who participate in this week-long sprint will be uniquely positioned to pursue further support for developing a solution. How will intellectual property created during the week be handled? For this sprint, Ascend is on board with allowing those who participate in the sprint shared IP of the project with the assumption that the idea submitter will have some level of involvement in future development. Participants will not be paid. 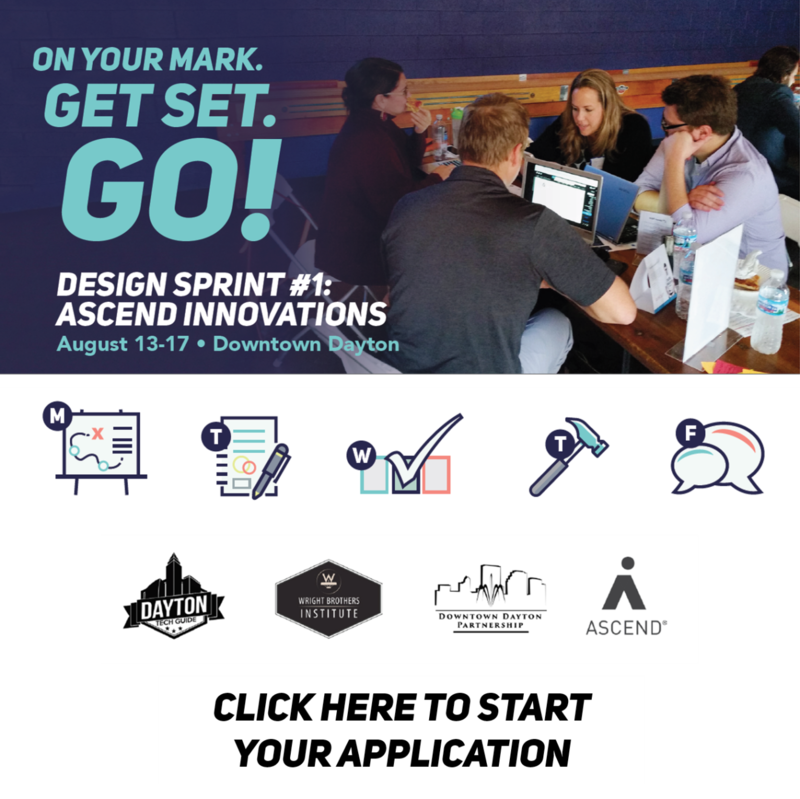 The Design Sprint is a highly valuable opportunity for individuals and startups to connect directly with large companies in Dayton. Additionally, participants have an opportunity to share in the ownership of the intellectual property generated as part of the sprint. Are there required experience levels or qualifications? No. The organizers intend to build a team that includes perspectives and approaches that are not typically part of a medical device design and development process.